I’m not just going through my list of house exteriors and picking my 10 favorites as my dream neighbors, though. If I did that, half of my town might be peppies (lots of fairytale doors and bright colors in the peppy section)! I want to have a balanced set of residents: an equal number of male and female villagers, and at least one of each personality type. The house will be above a winding dirt path that connects Re-Tail and a ramp to the beach. The path and the house will be surrounded with colorful tulips and fruit trees, and maybe also some bushes, tree stumps, and mushrooms. His house exterior might be one of my favorites, fairytale criteria aside. His cabin-themed room is so cozy and well-done! His house exterior doesn’t really match the rest of the houses I have in town. His brown house might sort of clash with the bright pink and blue Re-Tail building nearby. His house exterior would better match the rest of my town’s houses. His house would coordinate pretty well with Re-Tail nearby, since his house is bright blue with a touch of pink, and I think the brick fence would be lovely surrounded by colorful tulips. Even though his house meets my criteria the best out of all the lazy characters, it’s still not one of my favorite house styles. Doc’s appearance and house interior might not be quite as appealing to me as Erik’s (but still, fine enough imo). I also wanted to share about a book for AC:NL I got for my birthday that I think is pretty cool! It’s not just a standard guide book, it’s kind of specialized towards the designing/customization aspects of AC (landscaping, room decorating, patterns, etc.) — what a neat concept! This one, village 02, was my favorite! The suggested PWPs were a windmill, tulip topiary, and brick bridge. It looks like village 03 is the same as 02, just at wintertime? I loved how convincing the snow on the path looked! There’s a guide for all the hybrids too, but this one is for the more difficult hybrids: the purple tulip, black cosmo, purple pansy, and blue rose. I heard that the English Prima guide has a mistake, saying that blue roses are made from BlackxPurple, so it’s good to see that this guide shows the idea of “generations” of roses being important to produce blue roses. Carpet/wallpaper tips. Depending on how you choose to tile the pattern, you can do some pretty cool things! The section that might’ve been most enlightening for me was on furniture customization! I didn’t know about the option to re-make this white pot; I especially love the one with flowers on it (so much that you can see I dog-eared the page xP), I’m going to reburbish that one myself! A fair amount of options for this chaise lounge. I’d heard that the throne could be refurbished, but didn’t know what all the options were or what they looked like, cool! Posted on March 4, 2014 by Amy •	This entry was posted in AC:NL, Citalune and tagged Animal Crossing. Bookmark the permalink. 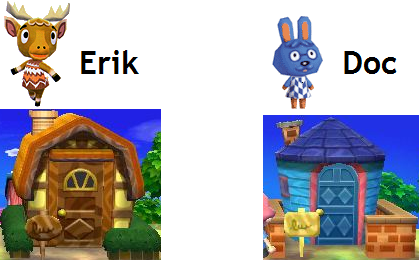 Hm… Those villagers are hard choices.. to have a nicer looking villager or a house that looks more fitting in your town… if it were me, I’d pick erik instead.. xP I rather have good villagers than good house designs but you seem to like both of them equally so I really don’t know.. Your AC book looks cool! I got a prima games one, but how did you get that? I guess it depends, but the blue one and the yellow one (3rd one) are cool. That book again, the winter lighting one is cool. Mind if I cope the picture for my own ideas? (not to post on the internet btw) Those carpets remind me so much of optical illusions 😛 Seriously!? a pink one/. Since it’s a Japanese book, ordering online is your best bet if you’re interested. Here’s a link on Amazon for instance, but there may be better places to order it. That picture you’re referring to with the 9 houses is actually of my already-decided-on dream neighbors, and I was asking for the opinion of Erik vs. Doc for my dream lazy resident, sorry for the confusion! Ok! Its just I asked for one for Christmas, and I ended up with a different one.Also, I’m sorry but I wanted to know who that villager was because I actually wanted him. Oops.. Sorry about the villager thing. I didn’t read your last comment until a minute ago. oh yeah, you know the first house? What is the name of the villager who owns that? Aw, that guidebook is freakin’ adorable! Haha, thanks for the feedback 😆 I guess I figure I can grow fond of anyone after a while 😛 But Erik would indeed be a nice neighbor to have! Gosh that sounds like a huge undertaking you’ve got going for this winter! I think it also takes guts to completely redo a previously well-established landscape like Citàlune’s, so good job for going for it, and good luck for completing it! Congratulations on completing the villager houses guide too! With WordPress’ limited formatting options, I think you’ve done an excellent job on it, and the category links are really thoughtful! The QR code page looks like a ton of work, too x_x It’s so generous of you to share all your hard work and continue updating the fairytale bridge path like that. There’s so much going on in your blog even when you’re busy with study! Oh my your town’s houses are gorgeous when they’re grouped together like that 🙂 As for your dream lazy villager, I think you can already predict that I’d be significantly biased towards Erik’s adorable cottage house. Even when I read up on your pros and cons, Erik’s ends up sounding better 😆 Despite his door not matching the rest of your town, I think the overall atmosphere his house conveys is an important factor as well. Though as for which atmosphere you’re going for, that’s up to you to define: what atmosphere each of those houses gives, and what atmosphere you want in that spot by the cliff, which is cozy corner yet open cliff at the same time. As for Doc’s house, even though he has the fairytale door, something about the cylindrical shape combined with the wooden panels rubs me the wrong way 😕 It feels detached from the rest of the fairytale style. But as I said, I’m extremely biased, and Erik’s house happens to fit my tastes perfectly, and in your town it’s your tastes that matter. I’m always a bit sad to overwrite past dream updates too, just because most of the time they were during a particular time of year I liked or there was some special weather going on that I don’t know when I’ll see again (as for my town itself there’s not much to feel sad about cos it barely changes 😛 ). I did hear that updating your town on a different 3DS can give you a new dream address though, so you could in a sense preserve your previous dream until it gets removed from the server… But I doubt you could go back to a previous address, so things could get messy in terms of sharing it with others if it keeps changing. (I also don’t know how changing 3DS’s effects the game info such as playtime and friends – I know so far that it changes your HHS). I see a good amount of new things whenever I visit, actually! In your latest update there are new projects like wisteria trellises (a part of your house-repelling project I assume, but they look very beautiful and spring-like as well! ), flower re-arrangements, room changes, neighbors, etc. Oh, thanks for the info on that! 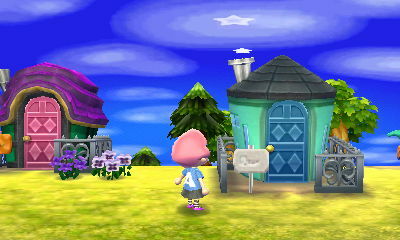 I’d heard about dream addresses changing for others, and while I like the idea of having multiple dreams uploaded for people to visit, I don’t really like the idea of my address changing, or people searching for my town in the dream suite and seeing two there, and thinking “which one is it?” I do have access to my dad’s 3DS (which is really my old 3DS, I guess) most of the time since he doesn’t really play anymore, and I have played in Citalune on it before, so this is something important to keep in mind, thanks! Yeah, I decided I’ll be letting Melba go eventually 😦 Her house style isn’t consistent with the others I want to have, and the location is imperfect too. Most of my neighbors’ houses are one space away from the path, and hers is two spaces away; and her house is across from Gloria’s but not aligned with Gloria’s. So her house isn’t aligned correctly either horizontally or vertically, and that along with her house style (which isn’t ugly, but doesn’t match the rest of them and isn’t one of my favorites), would feel like too big of a flaw in my town for me But I’ve been able to enjoy having her in my town for a while now and I’ve gotten several pictures, and I’ll always hold a special place for her in my heart, and be able to visit her in Dafdilly 🙂 When she moves I’m not sure if I’ll give Melba to a friend (I know Liam likes her a lot), or if I’ll move her to my other town. I picked up on bits here and there (better at reading), but I admit I didn’t understand the whole video xP After a few years I’m pretty rusty (switched to taking Spanish in college). Oh since you’ve actually played Citàlune on two 3DS’s, I wonder if you have a better idea of what it affects in the game? Did you notice if your Best Friend list and HHS houses restored themselves whenever you came back to your XL? I don’t have access to my usual friends on my dad’s 3DS (my dad’s only 3DS friend is me), but I don’t think anything changes when I go back to my own 3DS, and my BF list is still intact. 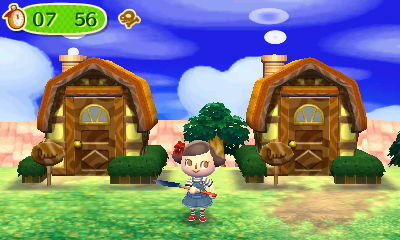 And actually, nothing changes for me as far as HHS houses even when I’m visiting the showcase on my dad’s 3DS. All my SpotPass houses are still there, and my one StreetPass house (my dad’s character) is still there with the lock icon over it and all. But I don’t know if this is the usual experience for everyone! I have no idea 😮 I would’ve been more cautious if I knew about the risks, but I’m glad my HHA houses are still there. And I’m sorry that you had trouble earlier with losing Reggie’s house, that’s a bummer >_< I wonder if the data transfer when switching from one 3DS to the other had something to do with it. I did my data transfer before starting my town. But yeah, I don't know! Thank you very much for the feedback! 🙂 It’s given me more to think about, and it’s good Doc has someone in his corner too (imagining both Erik and Doc watching the debate closely to see who will get to move in xP). I wish I could try out both villagers before making my decision, but because of the 16 villager cycle requirement I should be careful and try to make my decision beforehand. Maybe I’ll try to finish re-landscaping that area (because I was not planning on leaving only red/white/yellow tulips there forever), and then I can copy and paste Erik’s and Doc’s houses there to see which looks most fitting 😛 Thanks again for the help! You’re smart to take as long as you need to decide who moves in. Don’t be hasty–that 16-cycle (although it has its benefits) can be nasty. That. Book. I ordered it like a month ago, after seeing WiiFolderJosh make a video about it, but it still hasn’t come! 😦 It’s probably just due to it being shipped from Japan so I’ll wait a little longer before following it up but this post has gotten me even more excited for its arrival! Hehe, thanks for voting! ^_^ Oh, cool! Yeah, it took a while for it to get here too, I’m sure it’s nothing to worry about! My vote is for Erik because his cabin fits your winter idea much better.